Royal Canin Rottweiler Adult Dog Food contains specific nutrients and are enriched in taurine and EPA-DHA to help support good cardiac function. It contributes to maintaining muscle mass with an adapted protein content and L-carnitine. Helps support healthy bones and joints and helps maintain ideal weight. Complete dog feed for healthy cardiac function, ideal muscle mass and healthy bone and joint. With exclusive kibble for molossoid jaw. 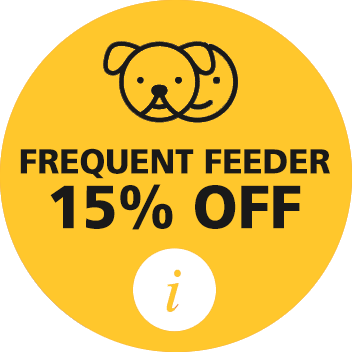 Complete feed specially for adult Rottweilers over 18 months old. rice, dehydrated poultry protein, animal fats, vegetable protein isolate*, maize, hydrolysed animal proteins, minerals, vegetable fibres, fish oil, beet pulp, soya oil, dehydrated tomato, hydrolysed yeast (source of manno-oligosaccharides), hydrolysed crustaceans (source of glucosamine), marigold extract (source of lutein), green tea and grape extracts (source of polyphenols), hydrolysed cartilage (source of chondroitin). ADDITIVES (per kg): Nutritional additives: Vitamin A: 26600 IU, Vitamin D3: 700 IU, E1 (Iron): 48 mg, E2 (Iodine): 4.8 mg, E4 (Copper): 6 mg, E5 (Manganese): 63 mg, E6 (Zinc): 188 mg, E8 (Selenium): 0.11 mg, Taurine: 2.5 g, L-carnitine: 830 mg - Preservatives - Antioxidants. ANALYTICAL CONSTITUENTS: Protein: 26% - Fat content: 20% - Crude ash: 7% - Crude fibres: 2.6% - EPA and DHA fatty acids: 5 g/kg. Michael says... Our rottie looks amazing with these biscuits. He is healthy and happy. juliette says... This food has worked really well for my rotties coat. She has more energy and stamina. Her total wellbeing has improved tremendously.